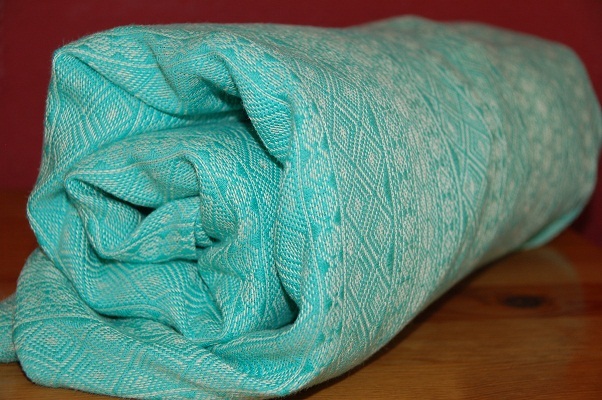 all i can say right now is that there are some interesting new things going on with didymos. it was said that it’ll take 3-4 days for delivery and right now some people are suprised that they received an email that they’ll have to pay in advance even it they have chosen to pay after receiving the wrap. but some people already got the first coloured hemp and it is beautiful from the pics i have seen. can’t wait to receive my wrap. prewash it feels quiet a bit crunchy, but i’m sure this is due to the starch didymos is using on the wraps to facilitate the weaving. the colour is hard to describe and i sometimes think of the caribbean sea and sometimes of our toothpaste. i’m not sure if a lot of people can rock this colour and i’m not sure if i’m one of the few that do. but as this is the first 50% hemp wrap and the first coloured hemp wrap ever i will give it a fair chance (and there is always the possibility to dye…). postwash the wrap is already softer and really moldable. my lo (2 years, nearly 14 kg) feels very comfortable on my back in a double hammock. there is no sagging and i’m sure that the wrap well be much more softer when it is starting to break in.there is a lot of shimmer in this wrap and when the sunlight is playing on it. by the way: i realized that this 50% hemp wrap has also quite a few nubs and slubs just like a linen wrap has. i didn’t recognize them on the 40% hemp indio, but maybe they are harder to see if the wrap is not two coloured. i really hope there will be more 50% hemp wraps coming. 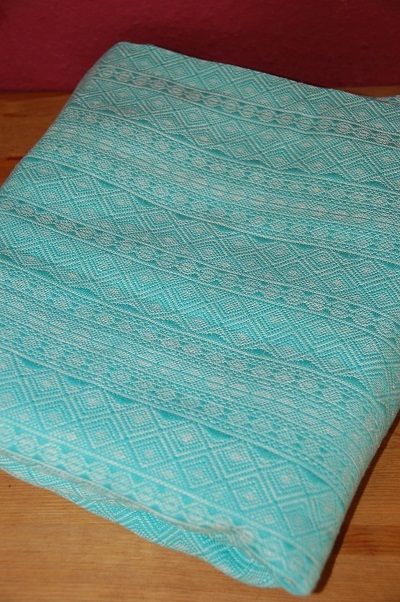 i just love that didymos became so experimental lately with different colours and blends.